Card Text: Equipped creature gets +3/+3 and has first strike. Whenever a creature dealt damage by equipped creature this turn is put into a graveyard, you may remove that card from the game. If you do, put a 2/2 black Zombie creature token into play. Oracle Text: Equipped creature gets +3/+3 and has first strike. Whenever a creature dealt damage by equipped creature this turn dies, you may exile that card. 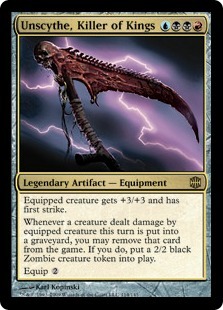 If you do, create a 2/2 black Zombie creature token.